For his directorial debut, Russell Crowe has attempted to tell a tale of war, tragedy, loss, romance, and healing. The results of his overreaching are evident early on and the final production is so jammed with subplots and secondary characters that it often feels like the Cliffs Notes version of a complex novel. This is mini-series material and, by compressing it as he does, Crowe creates something frantic and hurried with little room for subtlety or nuance. It is said that few things are worse than for a parent to outlive a child. 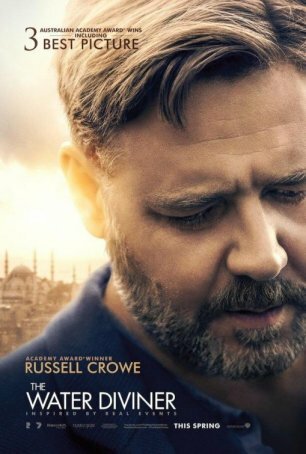 Connor (Russell Crowe) has been forced to do this three times over - his sons were all lost on the same day at the Battle of Gallipoli, four long years before the events of The Water Diviner take place. Connor has dealt with the pain by concentrating on his work as a farmer and water diviner. His wife, however, has retreated into a shell from which she escapes by killing herself. Alone and bereft, Connor decides to travel to Turkey to retrieve his sons' remains so he can bring them home for burial alongside their mother. What he finds at the far end of his trip is a land torn by strife. With the Ottoman Empire in its death throes, Connor is denied a permit to visit the battlefield and his trip seems destined for failure until Ayshe (Olga Kuryenko), the owner of the hotel where he is staying, tells him of a way to reach his destination that doesn't require official permission. The Water Diviner is at its strongest during its early scenes. Crowe portrays Connor as a salt-of-the-Earth type - a stubborn, solid man whose grief, although buried, occasionally bubbles to the surface. Flashbacks provide glimpses of his life before the war as well as detailing the last moments of his three sons as they are mowed down by machine gun fire. The wheezing, agonized death of one of the boys is painful to watch. While in Turkey, Connor becomes attached to Ayshe, an Australian-hating widow whose son worms his way into the gruff man's affections. This aspect of the story is awkwardly introduced and never especially credible. Although it's emotionally satisfying for Connor to find someone new to care about after having lost everyone close to him, there's nothing authentic about the romance; it feels like a writer's construct. The same is true of the improbable trek he goes on with a Turkish major (Yilmaz Erdogan) who has decided to join a battle against the invading Greeks. While the first half of The Water Diviner is assured, the second half is filled with contrivances and artifice. The Water Diviner isn't really about the turmoil surrounding the demise of The Ottoman Empire. Although sketched poorly, that merely forms the backdrop. This is about a man coping with unimaginable loss and coming to grips with the guilt he feels for having not stopped his children from going to their deaths. It concerns fathers and sons (dead and alive). The cinematography is gorgeous and the battle scenes are effectively recreated. It's just unfortunate that Crowe didn't allow the characters and their circumstances to breathe. Had that been the case, we might have been swept away by this would-be epic rather than feeling it blow by so quickly that it barely touches us.